Membership dues are for the fiscal year July 1 through June 30. 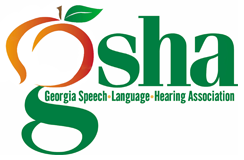 GSHA does not offer pro-rated dues for mid-year joins. GSHA distributes all membership renewal notices in April. Membership shall be considered lapsed if dues are not paid by June 30 of that year. Click here to view GSHA's Code of Ethics. Regular Membership ($125) - Join Now! Regular membership is open to individuals who have a Master's Degree or equivalent with the major emphasis in speech-language pathology, audiology, speech and hearing science, or education of the hearing impaired; or who have a Master's Degree or equivalent in another field, with evidence of active research, interest or performance in the field of human communication. Associate Membership ($100) - Join Now! Associate membership is open to individuals who have a Bachelor's Degree, but who do not meet the academic requirements for Regular Membership. Student Membership ($35) - Join Now! Advocate Membership ($35) - Join Now! Advocate membership is open to individuals (e.g., parents, caregivers, and adult consumers) with an interest in the goals of GSHA and the field of human communication and its disorders. Advocate members must not be professionals holding a bachelor's or graduate degree in speech-language pathology, audiology, speech, language, or hearing science, or education of the hearing-impaired. Corporate Membership ($400) - Click here to complete the online form; Click here to download the application form. Lifetime membership is open to individuals who have held a GSHA membership for 10 years and have attained the age of 65; annual dues are waived. Honorary membership is provided to individuals who have made significant and unusual contributions to GSHA. These individuals are selected by the Executive Council .